Every business dreams to be on the first page of all search engines. Sadly, this cannot happen for everyone. Every business dreams to be on the first page of all search engines. Sadly, this cannot happen for everyone. Google, today uses 200+ algorithms for scoring search engine rankings. Last year alone, they introduced 540+ quality improvements exclusively for the search engine. Use of organic SEO strategies eliminates spam and artificial bots and boosts the visibility of businesses on the Web. At WebTecMart, we use the white hat techniques to help your organization visibility on the popular search engines of Google, Yahoo! and MSN and improve your website traffic. 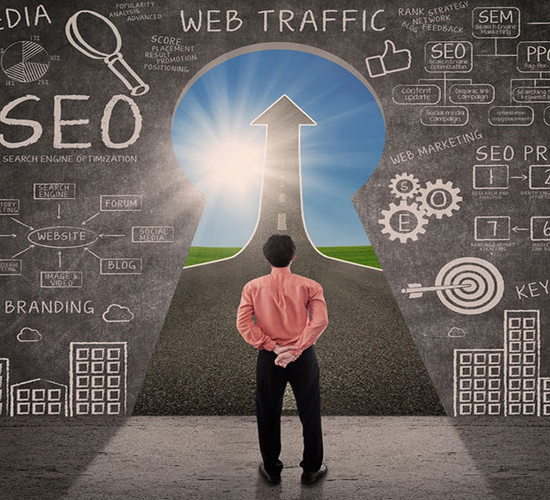 Our organic SEO strategies are tailored to your unique business goals, industry, and market competition. Technical Audit: : Our technical experts analyze your website to make it more search engine friendly - your website can easily index, crawl, and be discovered. We analyze your website for quality content and Meta tags, keyword effectiveness, HTML code errors, page loading time, page ranking on premium search engines and link popularity. Market and Keyword Research: We analyze your market and competitors to find the high-ranking keywords that will help you gain visibility and drive traffic to your site. Onsite SEO: We analyze site structure and internal architecture with improved alignment and relevancy of targeted keywords. Get suggestions for schema, site migration, and more from our expert SEO team. Social Media Optimization: Help you reach target audience through all social media channels, including LinkedIn, FaceBook, Twitter and Pinterest. Penalty Recovery: We create a marketable, credible, and strong online reputation with proactive steps. We build search profiles, create blog high quality content, amplify and generate positive reviews, build profiles, and executive reputation. Interactive Content and Infographics: We create, design, ideate, and research content and infographic for effective brand sharing across the social media channels and the Web. Digital PR: Make the best use of our network with authoritative publishers, influencers, journalists, and bloggers. Content Marketing Mainstream media, blogs, and leading publications will be abuzz with discussion regarding your brand. Outreach: We will connect curated content and brand to key influencers on the web. People start discussing and sharing messages. Analysis and Reporting: It includes errors of HTML code, check loading time, link popularity, keyword effectiveness, content, Meta tags, and page ranks. Do not allow a tarnished online image affect your ROI. Call us at 011-9999674255 today !